Technology instructions for the Nicarry 131 STEM classroom/lab. If you experience any problems, call ext. 3333 or e-mail the Help Desk at mediaservices@etown.edu. Please visit our Web site at http://www.etown.edu/ITS for additional information. 2. Cable Box - You will not have to touch this. 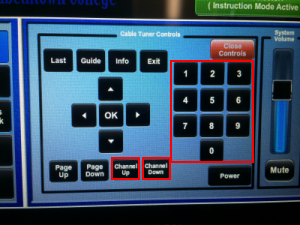 To control the TV settings, use the Cable Tuner option on the touch panel. 3. 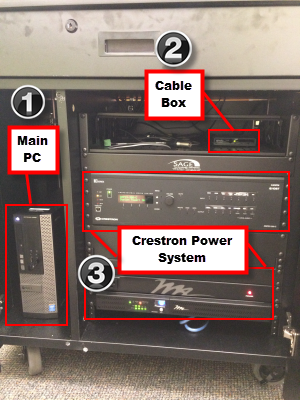 Crestron Power System - These are the main system controls for the Crestron Podium. You will not have to touch these controls. 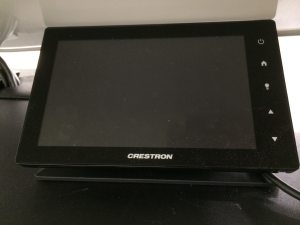 Every piece of equipment that you'll use in Nicarry 131 can be controlled by the touch screen found on the Crestron podium. This podium uses two different projectors. The projector on the right side is labeled Interactive Projector. The whiteboard under this projector acts as a touch screen. 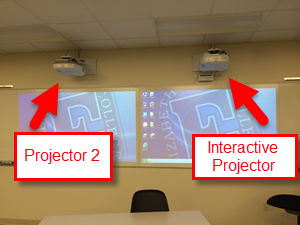 The projector on the left side is Projector 2. The whiteboard underneath this projector is not a touch screen. Notice: Please avoid writing on the interactive white board. Click Interact. Proj. Blank and/or Proj. 2 Blank to turn either of the screens on or off. Blue indicates screens turned off, black indicates screens turned on. This is where you control which input you are using. You can use the podium computer (screens labeled "PC [Left Mon.]" 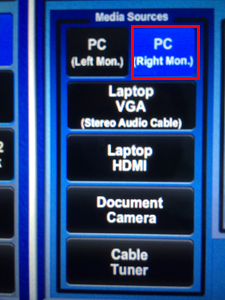 and "PC [Right Mon. 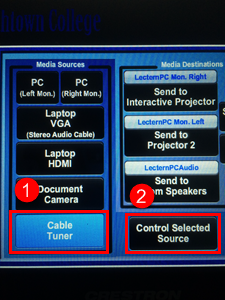 ]"), a laptop, a document camera, and even a cable tuner. 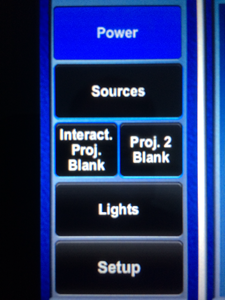 Any of these inputs can be projected onto either of the projector screens. PC (Left Mon.) 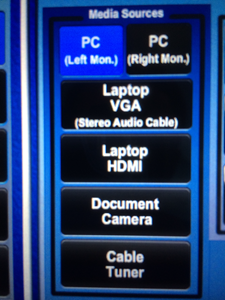 Click the PC (Left Mon.) 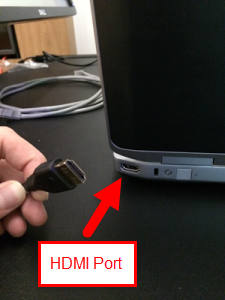 button to display what's on your main computer's left monitor to either projector screen. No need for any additional attachments; simply press the button and then decide where you would like to display your screen with the Media Destinations section. PC (Right Mon.) 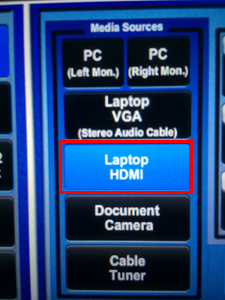 Click the PC (Right Mon.) 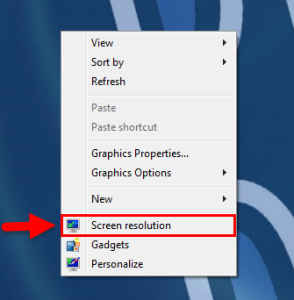 button to display what's on your main computer's right monitor to either projector screen. No need for any additional attachments; simply press the button and then decide where you would like to display your screen with the Media Destinations section. 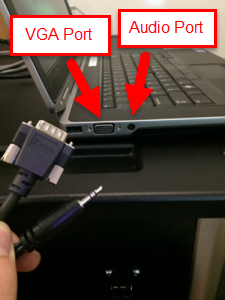 Laptop VGA Click the Laptop VGA (Stereo Audio Cable) button to display a laptop's screen via a VGA cord. Document CameraThe Document Camera button displays a document camera's screen onto either projector screen. 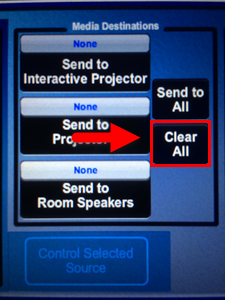 Click the Document Camera button to display what's under the document camera onto either whiteboard. 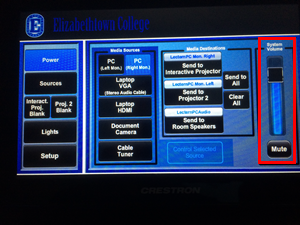 Click Control Selected Source to change settings on the document camera. Cable Tuner The Cable Tuner button allows you to broadcast television onto either projector screens. 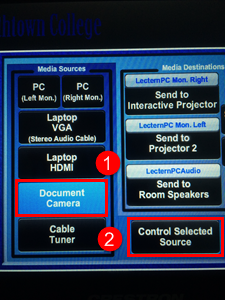 To display your desired input's screen with either projector, first choose the input you would like to use in the Media Sources section. 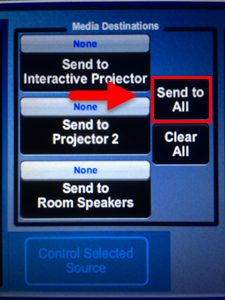 After choosing your input source, click either Send to Interactive Projector to display your input's screen onto the board on the right, or click Send to Projector 2 to display your input's screen onto the board on the left. You can choose to project onto one board at a time or both at the same time. 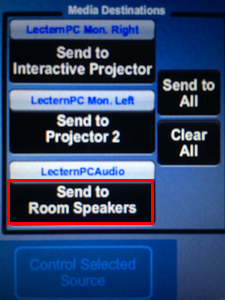 Click Send to All if you wish to display your input's screen onto both of the whiteboards. Note: You don't have to display just one input on either board. 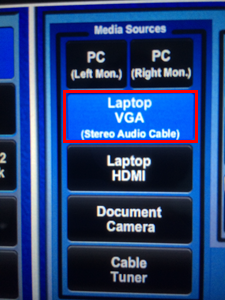 You can have one input display on one board and a different input display on the other board. 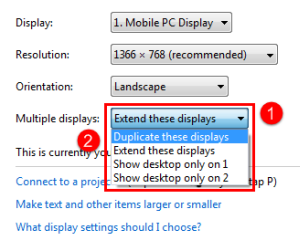 For example, you can choose to display a PC monitor screen on the interactive white board while also displaying a laptop's screen on the other whiteboard.